So you’re forecasting the season for the top 25 teams in college football. What do you think matters more, how good a team is or what kind of schedule they play? We all know strength of schedule matters, but how much? Might differences in schedule strength contribute as much to the final standings as differences in team quality? While listening over the last few weeks to season previews from the Solid Verbal and the Audible, it struck me that we analysts haven’t given schedule strength near the attention that we give “power rankings”. Ty, Dan, Bruce, Stew and others talk a *lot* about schedules when sorting through their expectations. Shouldn’t we be able to bring some data to that discussion? And might the results be surprising? The fundamental attribution error suggests we tend to neglect situational factors when sorting out people’s behavior. Who and where a team plays are pretty critical situational factors! Here at Massey-Peabody we consider them fully after the fact, but they’ve been sorely missing in our pre-season work. Here’s a quick pass at the impact of schedule on this season’s top teams. This is the quick-and-dirty version based on a quick simulation (details below) but it is sufficient for the main point. The impact is dramatic. For example, teams we rate almost identically – Texas A&M (#18) and Florida State (#17) – end up with wildly different forecasts due to the vagaries of their schedules. Playing in the brutal SEC West, A&M is forecast for 7.5 wins while Florida State, in the cushier ACC, is at 9.3 Almost 2 wins difference despite being a toss-up between them on a neutral field. It makes a big difference at the top, as well, flipping our predictions for numbers 1 & 2. We rank Alabama about ½ a point better than Ohio State, but expect them to lose 1 full game more because of differences in schedule. A 1 game difference in expected losses is equivalent in quality terms to dropping from #6 in our rankings (Auburn) to #21 (Mississippi St). We’ll get more sophisticated about this down the road. But wanted to share the main story, which is wow, this strength-of-schedule business is a bigger deal than you think. Methodology: We simulate the regular season using Massey-Peabody pre-season rankings (known with certainty, fixed over the season – both false). As always, college homefield is worth 3.4 points. 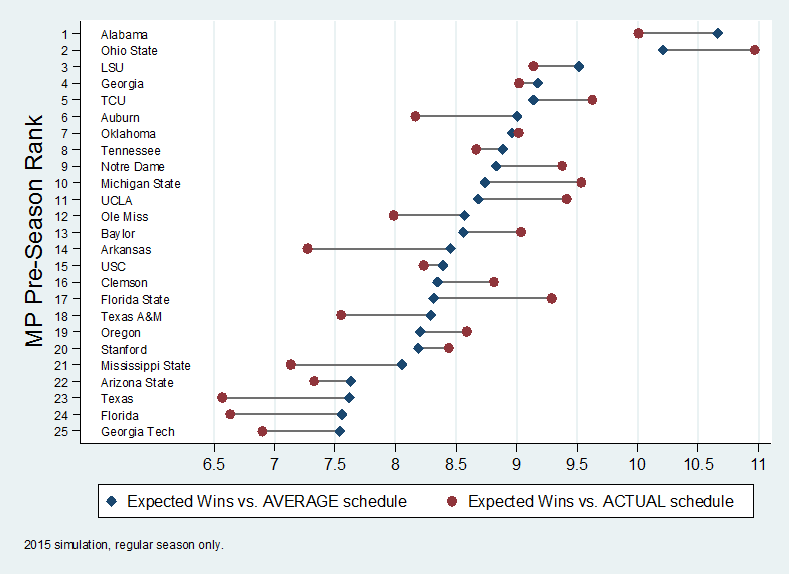 The “Expected Wins vs. Average Schedule” is drawn from the overall relation between pre-season ranks and simulated wins. Imperfect, but a rough, representative sketch. We’ll refine.